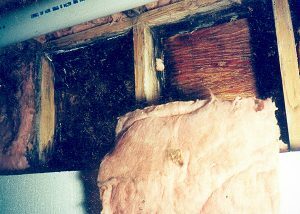 Don’t let mold grow in your building cavities after a flood. Flood recovery begins with drying and decontaminating the home as quickly as possible after the flood recedes. Materials like carpet, sheetrock, ceiling tile, insulation, and fiberglass ducts are almost never salvageable because you can’t decontaminate them. Begin by removing these wet materials. If the flood submerged the interior, cut a horizontal line at least 12 inches above the flood level and remove it with the wall insulation. The home’s wood framing, sheathing, siding and flooring must dry out to save the home. Removing exterior siding may be necessary or desirable for drying if the walls were under water. Open crawl-space access and skirting to maximize airflow to the crawl space. Clear foliage and debris from within 10 feet or more from the building to encourage airflow. Remove any floor insulation and dry or dispose if the insulation is wet. Strip all ceiling tile also, if the flood wetted them. Decontaminating the home, during flood recovery, requires washing all its surfaces wetted by flood waters or mud. Use a 5% to 10% chlorine bleach solution. A 5% solution is sufficient for lighter contamination when you can decontaminate quickly after flood waters recede. Use 10% for heavier contamination when the microbe community has incubated for a few days or more. To insure success, wash the surfaces twice within 30 minutes with the bleach solution. During flood recovery, someone must either clean and decontaminate the heating and cooling systems. If water damaged systems beyond repair, replace the home’s ducts along with its furnace and air conditioner. The furnace and air conditioner controls are particularly sensitive to water and may be damaged or may not. Many outdoor air conditioning and heat pump units are sealed and may just need a good cleaning. Find out as much as you can about the extent of damage yourself. Then consult an electrician or heating-and-cooling specialist, before deciding to repair or replace. If the weather is warm, move as much air as possible through the home’s open windows with large fans. Window fans work better for exhausting air than for pushing air into the home. Locate the fans to work with, not against, the prevailing winds. After initial drying, try to keep the humidity below 60% with dehumidifiers and heaters or with your air conditioner, depending on the season. In hot humid weather, drying may be slow and require some painful waiting. If it’s cool enough to endure heat, use space heaters and electric dehumidifiers along with fans and partially open windows to dry the home. After a flood, you’ll find appliances like dehumidifiers and window fans in short supply. Home owners living in areas with any flood history should buy one or two fans and dehumidifiers and store them near the ceiling when not in use. They can save your home after a flood. 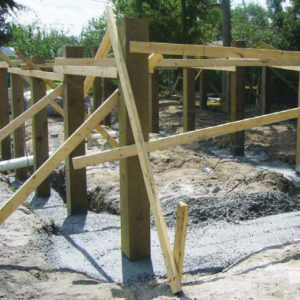 Consider a flood-resistant foundation as a permanent solution to flood damage. The flood’s aftermath presents an opportunity to make your home more energy efficient. During the renovation, carefully seal all interior seams on the ceiling, floor, and exterior walls to prevent air leakage. Replace furnaces, water heaters, dishwashers, and other damaged appliances with the appliances bearing the EnergyStar label. Think how to improve airtightness and insulation levels for winter. Consider how to reflect solar heat with solar shades and white roofing for summer. Consult these two books for more information about repairing and renovating homes energy efficiently.